Going to the far right end of Aquarium, at a point called The Sharp Unknown, and entering the giant magical storybook portal. Upon entering, you will then emerge from a well into the town. Going down Helios Tower from Ludibrium, to the tower's library on the first floor, and entering the giant magical storybook portal. 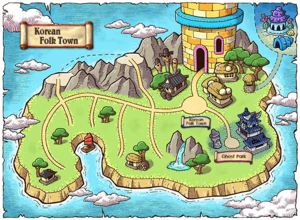 As a result, Korean Folk Town serves as a gateway between Ludibrium and Aqua Road. Helping Hongbu overcome his resentment towards his brother Nolbu, caused by the Stone of Rage. Helping Mr. Shim overcome his feelings of regret after his daughter Shim Chung's disappearance, caused by the Stone of Regret. Helping Haenim deal with a Hogul affected by the Stone of Gluttony, who threatens to eat Haenim's family if they don't feed him rice cakes every day. Helping Chil Nam and Chil Sung deal with a love triangle involving both of the brothers falling in love with Seolie, caused by the Stone of Envy. Helping Kong Ji resolve her laziness caused by the Stone of Sloth, as well as to help her win the heart of the Magistrate. Helping to prevent a Goblin from using the Stone of Jealousy to engulf Korean Folk Town in flames out of revenge for his late friend, the Nine-Tailed Fox. On the left side of town, you will find the entrance to Black Mountain. There, you can find monsters taken from Korean mythology. One of these monsters is the Moon Bunny that looks the same as the one that must be protected in Henesys Party Quest. The early Black Mountain area has a sunset background, while later areas as well as early divergent paths have a night sky background. At the end of the black mountain, there are monsters called King Goblins, which appear in three colors: blue, green, and yellow. The NPC's in Korean Folk Town are characters found in Korean Folktales. Each character provides a quest fairly related to the original stories they are from. Ghost Park is a training map that takes place after Korean Folk Town's story (note that you don't need to complete the quests to enter). It can be entered at the top right portal of the town. You can enter 5 times daily, each time lasting 10 minutes (if you can survive). If you die, you will be booted out immediately with no EXP loss. Enter in a party of 1~6 people. Charm Enhancements make it harder for you to survive and/or kill monsters but EXP is increased (not affected by your multipliers). Charms can be set to Level 0~3. Having multiple charms of the same level will invoke a set bonus to increase the EXP enhancements. Monster Level scales up to 145, and it is determined by average level of party members. As your party kills monsters inside, kill count increases. A high kill count will increase the monster EXP further (increment is not affected by your multipliers), up to +1,000%. Note that monsters spawned will be bigger and also deals more damage too. Monsters deal % HP damage so nobody can run away from dying. As your HP (measured by the proportion of your existing HP compared to your maximum HP) goes lower, your EXP gain will increase momentarily until you regain lost HP, up to +500%. No healing or drain effects, as well as recovery potions, can be used. Instead, every 1 minute, there will be a recovery rune that spawns. Use it to recover 100% HP for all party members. Additional rewards can be gained by participating in Ghost Park. Level 120, Untradeable, Provides +2 of either Weapon ATT, Magic ATT, STR, DEX, INT, LUK, or +50 HP. This page was last edited on 30 December 2018, at 08:29. This page has been accessed 82,005 times.